Business-to-Business design is a niche that requires highly practical and goal-oriented design, but that doesn’t mean it shouldn’t be attractive. I’ve worked on trade show booths and backdrops, large banners, and van wraps – just because it’s a non-traditional format doesn’t mean it can’t look great. I also have extensive experience with PowerPoint presentations, including custom template design as well as slide design and layout; whether it’s 10 slides or 150 I can roll up my sleeves and get the job done. 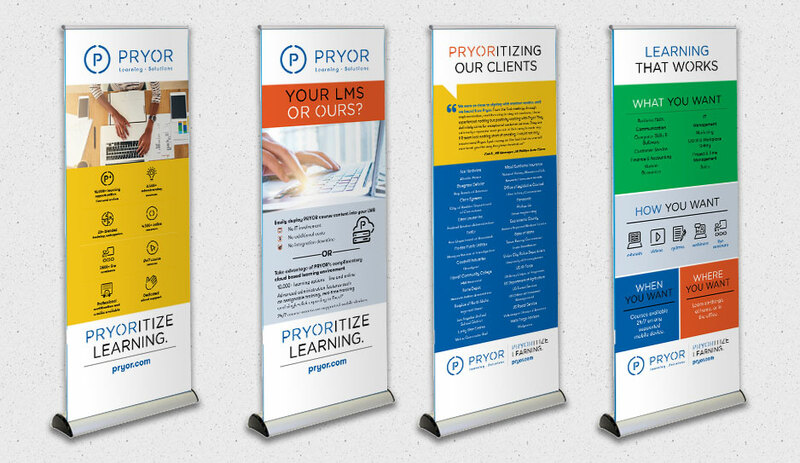 When Pryor Learning Solutions refreshed their identity, they needed a new trade show booth and complementary banners. This set was designed to utilize the new color story through vibrant, bold color blocking, as well as the new iconography. They looked nice together but each also worked as a standalone piece. 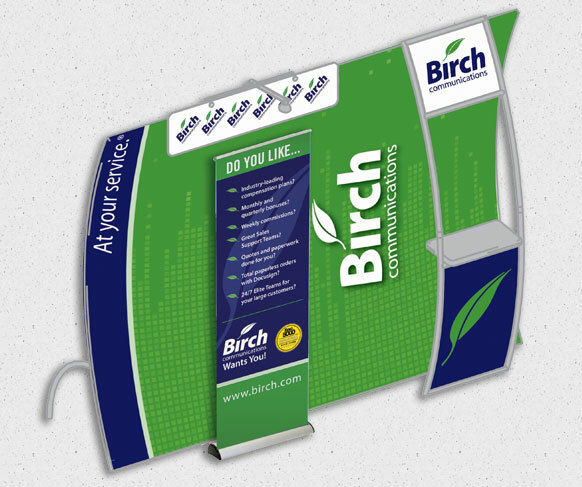 This trade show signage was done for Birch Communications. The booth had multiple components: a backdrop, header, shelving unit, and a standalone barracuda banner. They requested something abstract that would complement their existing brand look, and this was the end result: a cohesive trade show backdrop that fits right in with their materials. 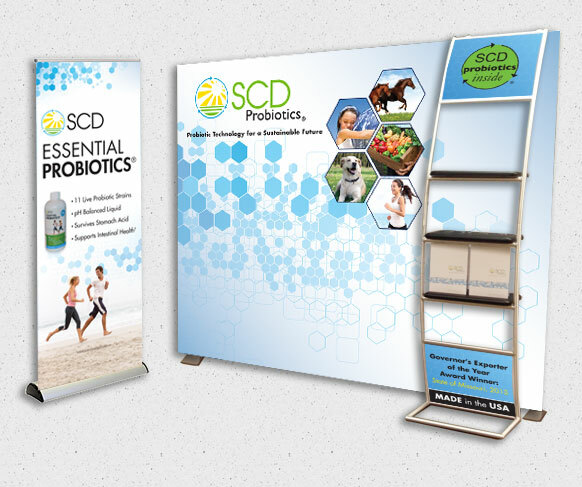 Kansas City-based company SCD Probiotics wanted a trade show booth that felt light and natural but also gave a tech vibe. I used a really lovely repeating honeycomb pattern in various blues to achieve this, and then followed up with a mosquito banner utilizing the same pattern to complement the booth. 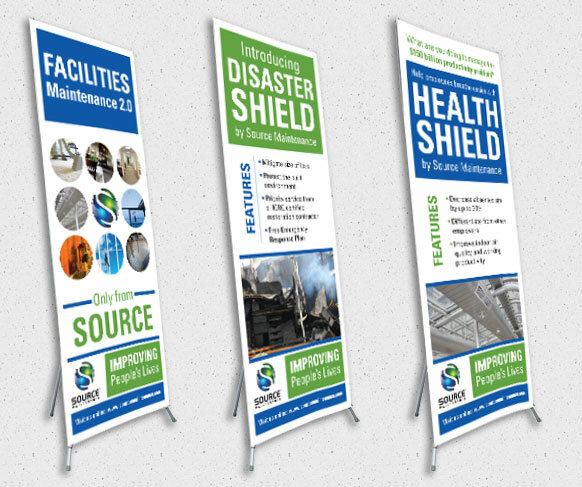 These banners were created for Source Maintenance, a company specializing in corporate cleaning services. These were created to complement other marketing material updates, with a focus on unifying typography and repetition of the circle motif. Kansas City-based The International Association of Assessing Officers (IAAO) came to me needing a template designed for general presentations and a specific layout for their "2020 Vision" presentation. Using their brand colors of orange and blue as a starting point, I pulled an image of the Kansas City skyline and colorized it in their brand colors. Interior slides use an infographic-style icon scheme to illustrate individual points. Pryor Learning Solutions commissioned this PowerPoint as part of a sales pitch to XPO Logistics. The design utilized XPO's brand identity and colors, paired with the Pryor iconography and overall look. I both designed and did all slide layout on this presentation for Hallier Reed, an independent insurance brokerage specializing in marketing and maintenance of employer and executive benefit programs. Focusing on the Affordable Care Act, the client used this presentation to advise client employees on the rules of the healthcare law. The color scheme keeps it on-brand while the icon design adds a bit of fun. 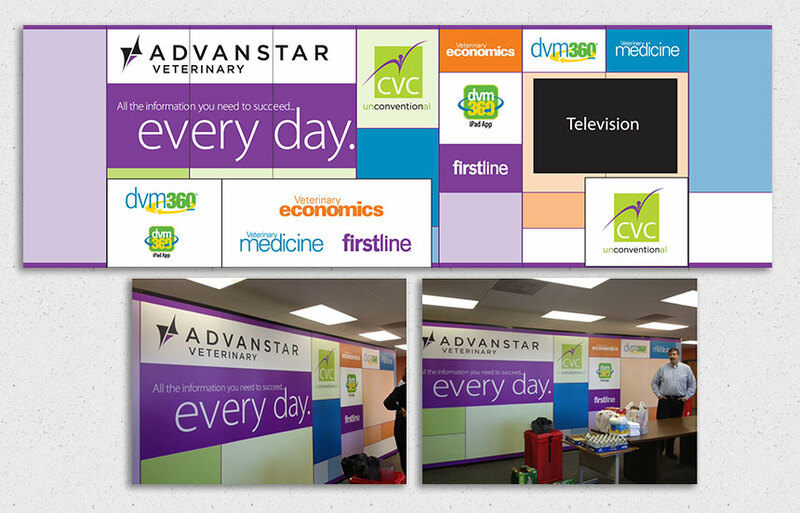 This 7-panel trade show backdrop was created for Advanstar Communications. I used the modular marketing look they were using at the time to my advantage, so that booth setup would be easier and it would mask the panel seams. The white portions on the bottom are representative of a table with logo panels hanging on the front. Copyright © 2019 , Pop! Creative Design. All rights reserved. Reproduction in whole or in part is prohibited.